All of the major beauty brands have had it too easy for far too long. They put whatever they want, including untested chemicals, into makeup that us girls just can't live without. For a while we were on the hook sponsoring them, but the word is out - your favorite drugstore makeup brands really don't care about the damage being done to your skin, eyes, nails. If they did, they would have done something about it a long time ago. So what's a healthy girl to do when makeup is toxic? Go bare? That's an option. For quite some time, especially as a new mother, I've been skipping makeup altogether because I didn't want to put the unhealthy stuff on. Not to mention that my makeup was about four years old! Yuck! Then the frumpy look got to me and I've found Emani Minerals, what a life saver! High performance makeup without all the nasty stuff, now that's good stuff. Thanks so much to Mimi at Emani for letting us try your mineral makeup. Mineral Concealer & Powder: I was never into the habit of covering my face in foundation, so I opted for this concealer and powder combination. They do have mineral liquid foundation as well though, that's hard to find! I love how subtly the concealer works with my under-eye circles (you can't really tell in the photo how bad they are). The powder blends seamlessly, doesn't look cakey, it's very light and perfect even for my dry skin. In the before and after photos below, my skin tone didn't actually become much darker, the photos are a few hours apart and it was getting darker outside. My complexion is a lot more even with this powder for sure. 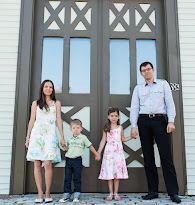 Yes, I made it more dramatic by not smiling in the 'before' photo! Mineral Hybrid Cream: I didn't have the right applicator for putting this Requiem cream eyeshadow on, so you can't even tell in the photo that I have it on. It is actually a very rich shimmery color, perfect for taking a day look to the evening level. Mascara: I've always had issues with mascara because it would sting or irritate my eyes. Not so with this one! I've had great success, even the times I would forget to take it off before bed. It holds up well to crying and rain, yet it's pretty easy to remove. It is soy based, and while it still contains some ingredients I would rather not see in makeup (like polyethylene), it sure is better than everything else I've tried. I really like the applicator, only it's a tad large for the container opening, so when you slide it out you have to use caution not to splatter mascara off the bristles. This applicator makes the mascara go on smooth and there are no clumps. Organic Lip Shine: I use this when my husband is not around, he doesn't like to kiss me with lip shine on! In the photo though you can tell what a big difference some light lip shine can do for lips! As is my lips look so pale and washed out, this Rain Maker lip shine is barely noticeable yet brings my lips to life! Crushed Mineral Blush: I love love love this Portofino blush! It can be just as successfully used as eyeshadow. It is perfect for my skin tone. Since I like my makeup subtle and natural looking, this blush gave just the right amount of color to my face and a subtle glowing shimmer. One Eco-Babyz reader will win an Emani Vegan Lip Brush, Base Transformer, Hydrating Lipstick in Ava, and Color Dust in Champagne! Over $50 value! 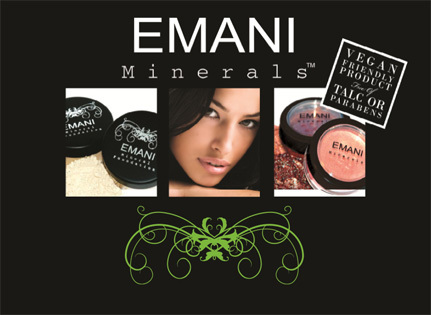 MANDATORY ENTRY: Visit the Emani Minerals website and tell us which product(s) you are interested in trying. I would love to try the Pressed Mineral Foundation. I'd like to try the liquid mineral foundation. I would love to try the brush kit under what's new! I'd like to try the Mineral Concealer. Thanks for the giveaway! I would love to try the 808 Glitter Dust Halo. I am interested in trying the mineral hybrid cream in Frisky! I like you on Facebook (my FB name is Amanda Moore) and posted that I entered the Emani giveaway! I would like to try the Organic Lip Shine in Mood Swing! I posted on your FB wall! I've never had much luck with the powdered mineral foundation. I would really like to try the liquid form. Another great item on their site: the brush kit. Hsving the right brush for the job is really important. I would love to try the Mineral Concealer and powder! I'd like to try the Brush Kit! I'd like to try the Crushed Mineral Foundation. I would like to try the Liquid Mineral Foundation. I would love to try the mineral hybrid cream for eyes! I would love to try their liquid mineral foundation. I would like to try the hybrid foundation. You look AMAZING! The lip shine treatment looked great too. I'm your newest friend on GFC! I would love to try the Crushed mineral blush in 1089 Cosmopolitan-such a soft, pretty color! I've heard good things about the Hydrating Serum & Primer. Love to try that! I'd most like to try the Liquid Mineral Foundation, primarily because I'm accustomed to liquid foundation and not sure if the Pressed Mineral Foundation would work as well. I'd love to have the pressed duo bronzer. I like the 2 different colors that I could blend. I'd love to try the Organic Soy Infused Mascara. I'm interested in trying the V Series brushes. I would love to try the makeup kit in light. Thanks! I'd love to try their Organic Lip Shine in Mood Swing. I would like to try the concealer combo (among many of the other products !) By the way, the make up looks subtle and natural on you, and is a real motivator to try Emani. I would also love to try the organic lip shine. I would like to try the Organic Lip Shine in the shade of Name dropper. I would like to try the Crushed Mineral Blush in Cancun Heat. I Joined Emani on Facebook and posted on their wall that Eco-Babyz sent me. I Follow EmaniMinerals on Twitter. I follow Emani on Twitter (dramaqueensmum) Not sure if my last comment worked. I would love to try the 808 Glitter Dust Halo, thanks! I would like to try the 719 Coco/Black (Eyes).